Mathematical Models: Right or Wrong? a) Non-Conservative Factors: More Deaths than Expected? b) Conservative Factors: Fewer Deaths than Expected? In the Spring of 1978, Ontario Hydro signed contracts with Denison Mines and Preston Mines to supply uranium for those nuclear reactors already operating, under construction, or firmly committed in the Province of Ontario. The value of these contracts may exceed $7 billion. As a result, the town of Elliot Lake is undergoing phenomenal expansion. Uranium production is expected to increase by a factor of about five over the next few years. Whole new subdivisions are springing up to accommodate the workers and their families. Unfortunately, many of these new homes are showing high levels of radon gas in their basements -- presumably because of the natural radioactivity of the soil. This situation raises important questions of public health policy since radon gas is an extremely potent cancer-causing agent. Mechanical aids have been incorporated into the architecture of the Elliot Lake homes in order to alleviate the problem. In some cases, pipes have been laid under the basement floor, and fans have been installed to blow most of the radon gas outside the house. In other cases, the basement floors and walls have been coated with a special sealant designed to prevent radon gas from getting into the house. However, the problem cannot be eliminated altogether, nor can it be controlled in a maintenance-free manner unless the homes are built without basements or in an altogether different location. Recognizing the problem, the Province of Ontario has proposed a standard for an "acceptable level" of radon gas in newly built homes, following recommendations laid down by the Atomic Energy Control Board. In March of 1978, the Elliot Lake Environmental Assessment Board (which was established by an Order in Council to investigate the environmental implications of the proposed expansion plans) scheduled three days of special hearings in Elliot Lake to consider the question of radon gas in homes and the adequacy of the proposed government standards. The present paper is a summary of the evidence which I presented to the Board on March 10 and 13 on behalf of the United Steelworkers of America. Using data supplied by the Ontario Ministry of Housing, I argued that a 31 percent increase in the male lung cancer rate could result if the presently proposed standard for radon gas in homes is adopted. On the basis of this testimony, the Board recommended that the Province re-evaluate the radon gas standard which they are proposing. However, there is no indication that such a re-evaluation is taking place. The expansion is proceeding at an undiminished rate, and new homes are being built according to the very standard which is under question. Apparently, public health has to take a back seat to economic expediency. I was personally shocked to discover that the Elliot Lake Environmental Assessment Board had no funds to call independent medical experts to testify on the biomedical effects of radon inhalation. Instead, the Board had to rely on those experts brought in by the mining companies and by the United Steelworkers of America at their own expense. This is not conducive to a balanced perspective on an important public health matter, since the financial resources are heavily biased in favour of the industry. the cost of the lost person-days, for these 156 cancer deaths, calculated at a rate of $30,000 per year, would only be about $12,000. The stupidity and callousness of this calculation did not escape the Board. However, it is a shame that better testimony was not available. This little story, which can be found in the transcript of the Elliot Lake Hearings for March 13, 1978, provides a grim illustration of biopolitics at work. Biopolitics is the dubious art of justifying whatever economic decisions have been made by arguing that the biological effects will be negligible. It is my belief that the public health will be protected only when society is prepared to err on the side of safety rather than on the side of expediency. What is radon and what does it do? Radon is a naturally occurring radioactive gas. It is produced as an inevitable byproduct of the radioactive disintegration of uranium. Since uranium is found in small amounts almost everywhere on earth, radon gas is also found, in small amounts, almost everywhere. However, in places where uranium or its radioactive daughters are present in higher-than-usual concentrations, radon gas also occurs at higher concentrations -- for example, wherever there is uranium or phosphate ore, or the "tailings" left over from mining and processing such ores. Radon gas has a half-life of 3.8 days, whereupon it produces other radioactive substances (which are solids) known as "radon daughters". These latter substances, the radon daughters, are mainly responsible for the high incidence of fatal lung cancer in uranium and other hard rock miners. The radon daughters attach themselves to microscopic dust particles, which are then inhaled down into the deepest parts of the lung. Radon is much more harmful in a confined area such as a mine shaft or basement, since the radon daughters then have a chance to build up to higher concentrations, and thus deliver a higher dose of ionizing radiation to the lungs when inhaled. In 1967, in Grand Junction (Colorado), it was discovered that thousands of homes and other buildings had been built on uranium tailings, leading to high radon gas levels in homes, schools, and workplaces. In 1975, many homes in Port Hope (Ontario) were found to be constructed with radioactively contaminated material, creating similar problems. In 1976, hundreds of homes in Elliot Lake (Ontario) were found to have high radon levels indoors, presumably because of the higher-than-usual amounts of uranium in the soil. In 1977, some homes in Newfoundland were found to have been constructed using radioactive slag from a phosphate plant, leading to excess levels of radon gas indoors. Moreover, recent surveys have turned up "pockets" of homes having excess radon levels in almost every city in Canada. In all these cases, the inhabitants of such buildings are being exposed to radon levels which are much higher than average. The question is: since radon cannot be totally eliminated, what is an "acceptable level" in terms of public health policy? The proposed acceptable limit for radon gas in buildings, 0.02 working levels -- 0.02 WL -- is expected to cause some additional cases of lung cancer over and above the natural incidence of this usually fatal disease. The present paper deals with the question of how much additional lung cancer can be expected if a sizable population is exposed to such levels of radon in their homes, schools, and workplaces. What are the expected public health consequences? The Ministry of Housing does not expect that exposure to 0.02 WL of radon over a lifetime will cause more than a 5 percent increase in lung cancer among males. This conclusion is based on studies of uranium miners, most of whom suffered much higher exposures than those to be expected from radon gas in buildings. However, recent scientific evidence from many countries indicates that at lower dose rates, radon is much more effective in causing cancer (per unit dose) than at higher dose rates. If this is so, then the official estimates of the health effects of living in a radon atmosphere of 0.02 WL are grossly understated, and we have the potential for a major public health tragedy. Some of this evidence is summarized in the ensuing paper, and the implications for public health are clearly explained. Using only the data supplied by the Ontario Ministry of Housing to the Elliot Lake Environmental Assessment Board it is shown that continuous exposure to 0.02 WL for 12 hours per day could lead to a whopping 31 percent increase in the incidence of lung cancer for males. It is therefore concluded that the radon-in-housing standards have to be tightened up considerably. In March, 1978, there were three days of hearings by the Elliot Lake Environmental Assessment Board into the questlon of how much radon gas should be considered acceptable in new housing. At the invitation of Homer Séguin of the United Steelworkers of America -- the union that represents the Elliot Lake uranium miners -- I attended the hearings and testified as a mathematician on the health risks of radon gas. Using the Ontario Governrent's own published mortality figures, I pointed out that continuous exposure to the officially proposed level (for the maximum permissible dose of radon in new homes) would result in a 31 percent increase in lung cancer deaths among the exposed population. At present, 54 out of every 1000 males in Ontario eventually die of lung cancer. A 31 percent increase in this mortality rate means an additional 16 lung cancer deaths per 1000, for a total of 70 per 1000 -- a shocking increase in the incidence of an already shocking disease. At the time, I had no way of knowing whether my concluslons would stand the test of time. I had simply accepted the government's figures and used basic arithmetic to estimate the increase in lung cancer mortality. Nevetheless, the evidence I gave convinced the Assessment Board that a re-evaluation of the radon standard should be undertaken. A recommendation was made to that effect. It was ignored by both provincial and federal authorities. In 1980, the British Columbia Medical Association published a 300-page book-length report entitled "The Health Dangers of Uranium Mining and Jurisdictional Questions", written by two medical doctors: Eric Young and Robert Woollard. The authors, who carefully reviewed all available evidence from the leading medical authorities on the subject of radon hazards, fully confirmed my 1978 estimates. In fact, they estimated a 40 to 50 percent increase in lung cancer rates resulting from continuous exposure at the so-called "acceptable" level of radon exposures in homes. The Canadian nuclear establishment, which had been assuring people for years that low levels of exposure to atomic radiation are perfectly harmless, was understandably upset by these unpleasant predictions. The Atornic Energy Control Board (AECB) refused to credit the BCMA risk estimates, and yet made no attempt whatsoever to discuss the medical evidence with the authors of the BCMA Report. Atomic Energy of Canada Limited (AECL) published an angry retort, and tried, without success, to get the BCMA to disassociate itself from the Report. Today, the BCMA still stands behind the integrity of the Young/Woollard Report. Meanwhile, independent American scientific organizations -- notably the National Academy of Sciences (NAS) and the National Institute of Occupational Safety and Health (NIOSH) -- were arriving at conclusions very similar to those reached by the BCMA. The National Academy's 1980 BEIR-III Report reported risk estimates for lung cancer mortality caused by low levels of radon exposure which were fully consonant with the BCMA's findings. That same year, a NIOSH Report called for a tightening of the standards governing permissible levels of radon exposure, citing the results of numerous studies which indicate that low levels of radon exposure may be much more harmful than was previously thought. Although the AECB published Dr. Thomas' report, it has chosen to ignore it. In a slim thirteen page docunent published in 1982, the same Advisory Committee which commissioned Dr. Thomas' report dismisses it with scarcely a word of explanation. No reason is given, except that it doesn't "jibe" with the findings of various pro-nuclear bodies (such as the ICRP -- the International Commisslon on Radiological Protection) which the AECB prefers to place its trust in. Neither the Advisory Committee nor the AECB has prepared any critique of Dr. Thomas' work, nor have they identified any mistakes in his methodology. They just don't like his findings. The reason for their dislike became clear when, in November of 1983, AECB announced plans to completely change the existing regulations governing radiation standards. Under the new proposed régime, various vital organs in both atomic workers and members of the Canadian public could be exposed to considerably larger doses of radiation than are currently permitted. In particular, the maximum permissible exposure to radon gas could be increased by about 20 percent. Because of an unprecedented storm of opposition from all of the major unions representing Canada's 100,000 atomic workers -- including uranium miners, reactor operators, and those who handle radio-isotopes -- AECB has temporarily withdrawn its proposed new regulations on radiation standards. As of August 15 1985, no further effort has been made by AECB to relax the existing radiation standards. But the situation may change at any time. Radioactive pollution should be a matter of concern for all Canadians. Although this report deals only with lung cancer caused by radon gas I hope it is of some use in awakening other Canadians to the dangers we all face in an increasingly radioactive world. "I T ' S PERFECTLY SAFE , BUT DON ' T BREATHE TOO DEEPLY"
A mathematical model is a description of reality using mathematical language. Such a description or model can be simple (like a graph) or complicated (like a computer simulation). It is quite possible for such a description to be wrong, in that it does not give correct results when applied to reality, even though the internal mathematical logic is impeccably correct. A very simple illustration of this principle can be provided using a familiar geometric example. It was once thought that the earth was flat -- not an unreasonable assumption, since the earth looks flat. "Geo-metry" literally means "earth measurement", and in ancient days it was believed that the results of elementary plane geometry accurately indicate what happens on the surface of the earth. The fault is not in the mathematics; the fault is not in reality; the fault is in the mathematical model -- in other words the mathematical description of reality is not entirely correct. The previous example illustrates a general problem in mathematical modeling, which is the problem of extrapolating from known results to unknown regions. The ancients who developed the principles of elementary geometry lived in a limited region of the earth (near the Mediterranean), and in that region the geometrical principle seemed to be true that two perpendiculars drawn from the same line do not intersect. The ancient thinkers had no way of knowing that the behaviour of the two lines would change thousands of miles away from where they started, and that the two lines would eventually intersect (if drawn on the surface of the earth) some 6,000 miles later! The two examples just given reveal how, if the mathematical model is wrong, there can be a very pronounced divergence between the expected results (results predicted by extrapolating from the model) and observed results (what actually happens in reality). Living systems are more complicated in their behaviour than non-living systems, and consequently they are harder to describe. For this reason, mathematical models have been much less successful in the biological and social sciences than they have been in the physical sciences. In carefully engineered systems, a great many predictive mathematical models have been developed to a very high degree of precision and sophistication and there is a high degree of reliability in the accuracy of most of those models (even though they are sometimes found to be wrong). This point was brought home to me very strongly when I worked for the Science Council of Canada as the Assistant Director of a nation-wide study of the role of the Mathematical Sciences in Canada. The study examined the uses of mathematical modeling techniques in science, business, governments and industry, and concluded when living systems are involved that mathematical methods are very frequently misused, that mathematical models are very frequently in error, and that an undue reliance is placed in these models due to a lack of understanding of the problem of extrapolation. Copies of these proceedings have been deposited in all university libraries in Canada. The use of mathematical models to describe living systems is still in its infancy, and there is much to be learned. In the meantime, extreme caution must be used in applying such models to real life situations. There is no doubt that exposure to radon gas and radon daughters causes lung cancer, at least for sufficiently high exposures. This has been well established by studying the incidence of lung cancer in uranium miners and other hard rock miners. However, the precise nature of the relationship between lung cancer and radon exposure is extremely complicated, due to problems of measurement, lack of knowledge of the precise mix of radon daughters, the aggravating effect of dust, numerous biological factors affecting the latency period, synergistic effects with smoking and diesel fumes, and statistical uncertainties due to spontaneous fluctuations in the incidence of lung cancer. These complications are all well recognized (see for example the Ham Commission Report on the Health and Safety of Workers in Mines). In the early days, it was hoped that there was a "safe threshold" -- that is, a level of exposure to radon gas and its daughters below which no harm would be done and no extra lung cancers would be expected. However, experience has not supported the existence of such a safe threshold and no regulatory body in the world assumes that there is such a threshold. (Incidentally, this same "no threshold" principle seems to apply also to cancer-causing agents other than radioactivity). This linear hypothesis is the mathematical model which has been used in the Ontario Ministry of Housing Report -- the "MOH Report" -- to estimate the number of excess lung cancers that might be expected as a result of radon exposure in homes in Elliot Lake. It is also the model which has been espoused by the Atomic Energy Control Board as a (hopefully) "conservative" model -- which means that the model (hopefully) overestimates rather than underestimates the actual numbers of lung cancers that would be expected at low doses. In the case of x-rays, gamma rays, and beta rays, there is a wealth of experimental evidence published in the scientific literature which supports the contention that the linear hypothesis is conservative when extrapolations are made from high doses to low doses. To my knowledge, however, there is no such evidence published relating to low doses of alpha radiation, especially in the case of alpha radiation to the lungs. Rather, as we shall see, there is much evidence pointing to the opposite conclusion. 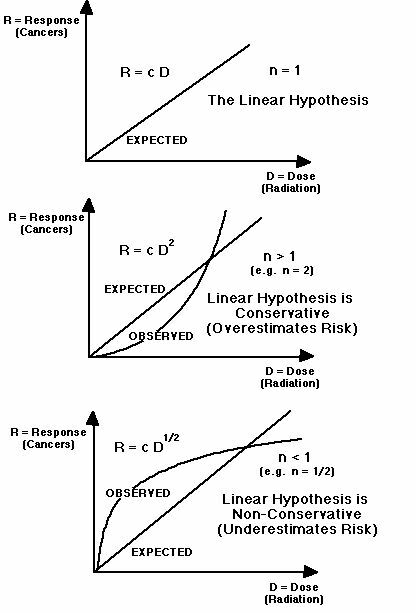 for other types of radiation (other than alpha radiation) and various types of cancer (including lung cancer) the linear hypothesis seems to be conservative at low exposures. But, in extrapolating from high doses to low doses of alpha radiation we encounter the classical problem of extrapolation of mathematical models from known results into unknown regions. Exhibits 1 and 2 on the following pages provide some additional information about the Congressional Seminar. Karl Z. Morgan, Professor of Health Physics, Georgia Institute of Technology, CHAIRPERSON. Irwin Bross, Director of Biostatistics, Roswell Park Memorial Institute for Cancer Research, Buffalo. Rosalie Bertell, Research Associate, Roswell Park Memorial Institute for Cancer Research, Buffalo. Victor Archer, Medical Director of U.S. Public Health Services, National Institute for Occupational Safety and Health, Salt Lake City, Utah. Seymour Jablon, Associate Director, Medical Follow-up Agency of the National Research Council; Staff Officer, radiation Effects Research Foundation; formerly Chief of Epidemiology, Atomic Bomb Casualty Commission. Edward Martell, National Center for Atmospheric Research, Boulder, Colorado; formerly Advisor on High Altitude Fallout, Strategic Air Command. Victor Bond, Associate Director in Life Sciences, Brookhaven National Laboratory; formerly on the National Academy of Sciences Advisory Committee on the Biological Effects of Ionizing Radiation. Ernest Sternglass, Professor of Radiology, University of Pittsburgh. Charles Richmond, Associate Director, Biomedical and Environmental Sciences, Oak Ridge National Laboratory. William Ellen, Criteria and Standards Division, Environmental Protection Agency, Office of Radiation Programs. Bernard Shleien, Office of Medical Affairs of the Bureau of Radiological Health, Food and Drug Administration. Mark Barnett, Associate Director, Division of Training and Medical Applications, Bureau of Radiological Health. Roger Mattson, Director, Division of Siting, Health, and Safeguards Standards, Nuclear Regulatory Commission. Helen Caldicott, Researcher in Cystic Fibrosis, Boston Clinic; formerly Director of Cystic Fibrosis Research, Adelaide Children's Hospital, Adelaide. Australia. In addition, there were several representatives from the trade union movement. Among the invited participants who could not attend were John Gofman, Professor Emeritus of Medical Physics, University of California at Berkeley; and Bernard Cohen, Director, Nuclear Physics Laboratory, University of Pittsburgh. The conference met at 9:35 a.m. on May 4 1976 in room 1202, Dirksen Senate Office Building, with Senator Gary Hart presiding. Let us go on to the next question. Question 3: Do these effects that we are talking about increase linearly with increasing dose? I believe data suggests that the cancer risk can, in a simple way, be expressed as an equation such as R (the risks) equals a constant c , times the accumulated dose D raised to some power n . In other words, R = c D n.
In the case of low-LET radiation -- for example, x- , gamma- , and beta-radiation -- the accumulated dose D must be corrected for repair of damage over time, as pointed out by Dr. Bond, in which it does appear in most cases that n is equal to or greater than 1 , suggesting the greater efficiency of multiple hits. 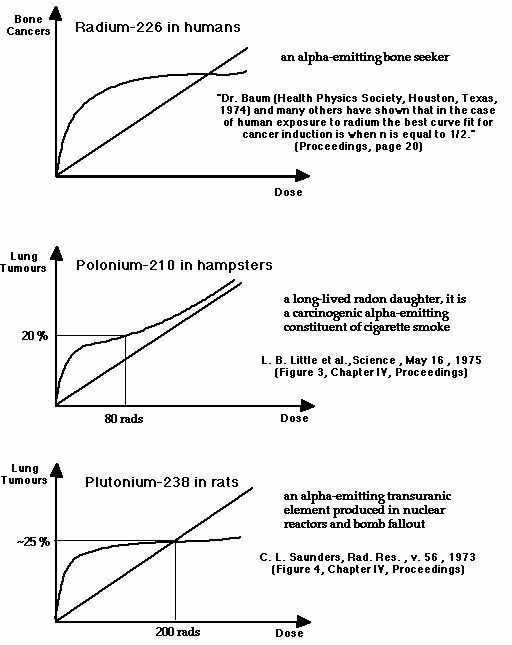 Dr. Baum (J. Baum, Health Physics Society, Houston, Texas, 1974) and many others have shown that, in the case of human exposure to radium, the best curve fit for cancer induction is when n is equal to 1/2 . Thus, for high-LET radiations, such as those from plutonium-239, the linear hypothesis underestimates the risk. Extrapolations are often made to zero of effects on animals and man, and they are sometimes extrapolated from the high dose descending portion of the parabolic curve where there would be overkill. Estimates are made from exposures to animals of short life span, and for a man (as pointed out in the BEIR Report) out to only about twenty years. Of course, other data over the remainder of man's life would have to increase the slopes of these curves or the risks per rem . A uniform population is usually assumed, taking little account of the age distribution and the disease patterns, as Dr. Bross has pointed out. There is cell sterilization at the higher doses, and so it is somewhat risky to extrapolate from these doses because you would underestimate the risk at low doses. I think quite important is the fact that the recent data from Drs. C. W. Mays and H. Speiss on radium-224, a bone seeker like plutonium and other actinide elements, indicate that the cancer risk increases with protraction of the dose. This is just the opposite of what we have observed from low-LET radiation. In summary, I would state that it is my opinion that the linear hypothesis is always non-conservative for high-LET radiation. Usually it is non-conservative for in-utero exposure of children to low-LET or high-LET radiations, but in some cases of adult exposure, it is probably conservative for low-LET radiation. I am sure I have provoked a lot of discussion. Dr. Sternglass? I would like to say that at the recent hearings by the EPA on radiation standards for the nuclear fuel cycles, I presented evidence, obtained by many people in the literature, that at the very low dose rates that we are talking about, we are dealing predominantly with a different biological mechanism than we are dealing with at the high dose rates. The recent data by Dr. Petkau show that as the dose rate decreases, it takes less and less dose to break a cell membrane. This evidence was not available at the time of the BEIR Report. What it means is simply this, that for somatic -- not genetic -- situations, we are now faced with a whole new problem, namely the fact that when cell membranes are injured as a result of indirect chemical effects, the data of Dr. Petkau -- both for free membranes and his new data on micro-organisms and mice -- show clearly that the lower the dose rate is, the less it takes to break a membrane. As a result, one is led to a non-linear effect at low doses, which is opposite to what we had expected in the past. In fact, the curve of response versus dose goes up much more rapidly at the origin, to the degree that this leads to an under-estimate of biological effects of very low doses using a linear extrapolation, of something like a few hundred, possibly as much as a thousand-fold. Now recent studies have shown that membranes are involved in the functioning of the immune system of the body. One of the most important things about the immune system is that it not only defends the body against viruses and bacteria, but we now know from recent evidence published in the last few years, that the immune system also detects and controls cancer cells. Thus, we are now faced with the evidence that cell membrane damage is possibly the controlling one in cancer induction at low dose rates, while at high dose rates, the controlling process seems to be direct damage to the DNA. This means that we now have a mechanism that we did not have before that can explain not only the very large increases in infant mortality, but also the changes in heart disease and cancer all over the world following the period of (atmospheric) nuclear testing. For definition of terms, see the glossary. For explanation of R = c D n , see Figure 3. Association Journal, v. 36, Aug. 1975, 567-575, by Karl Z. Morgan. If n = 1, the above equation produces a straight line graph which corresponds to the linear hypothesis (see Figure 3). If n is greater than 1, the equation corresponds to a graph which "scoops upward" and in this case the linear hypothesis would be conservative -- it would overestimate the number of deaths actually produced by low doses of radiation. However, if n is smaller than 1, the equation corresponds to a graph which "scoops downward" and in this case the linear hypothesis would be non-conservative -- it would tend to underestimate the number of deaths actually produced by low doses of radiation. For the sake of completeness, it should be noted that some of the mathematical models proposed to explain radiation carcinogenesis are composites of two of these three cases. 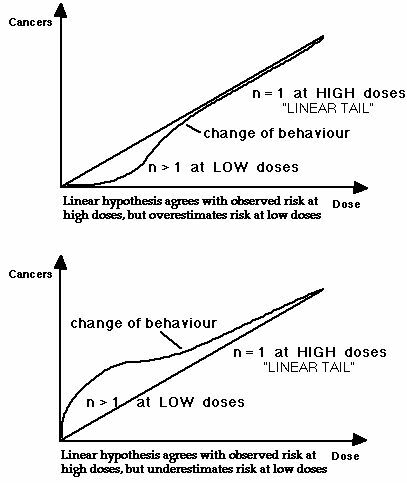 For example, some have suggested that for external irradiation, n = 2 might be appropriate for low doses and n = 1 might be appropriate for high doses, yielding a parabolic upward-bending curve with a "linear tail" (see Figure 4). On the other hand, if n = 1/2 were appropriate for low doses and n = 1 for high doses, you would have a downward-bending parabola with a linear tail (see Figure 4, below). The first composite would make the linear hypothesis conservative, while the second composite would make the linear hypothesis non-conservative at low doses. In order to test the linear hypothesis at low doses of alpha radiation, additional data is needed to see if extrapolation from high doses is appropriate or not. It has long been recognized that alpha radiation poses a different kind of radiation hazard than X-rays, gamma rays, or beta rays. Until recent years, there has been almost no data published in the scientific journals dealing explicitly with the cancer-causing ability of alpha radiation at low doses. (As indicated on page 5 of the MOH Report, with an erroneous conclusion that this lack of evidence establishes conservatism). In the last five years, however, numerous papers have appeared which indicate that at low doses, the linear hypothesis may seriously underestimate the cancer risk from alpha radiation. The evidence presented on low level alpha radiation is summarized graphically in Figure 5. It clearly suggests that at low doses, the linear hypothesis is non-conservative for alpha radiation. The evidence given here, reproduced from the Proceedings of the Congressional Seminar on Low-Level Ionizing Radiation, indicates that alpha radiation is more effective in producing cancer (per unit dose) at low doses than it is at high doses -- unlike x-rays, gamma rays, and beta rays. There may be published evidence in the scientific literature dealing with low level alpha radiation which would suggest a different conclusion. I am unaware of any such evidence, however. On January 19, 1978, I cross-examined Dr. Howard Newcombe of AECL (Atomic Energy of Canada Limited) on this subject at the Royal Commission on Electric Power Planning in Toronto, and he was unable to cite any evidence of a contrary nature. Dr. Newcombe is one of the best known radiation biologists in Canada. He is currently a member of the International Commission on Radiological Protection and has served on the Advisory Committee on the Biological Effects of Ionizing Radiation for the U.S. National Academy of Sciences.